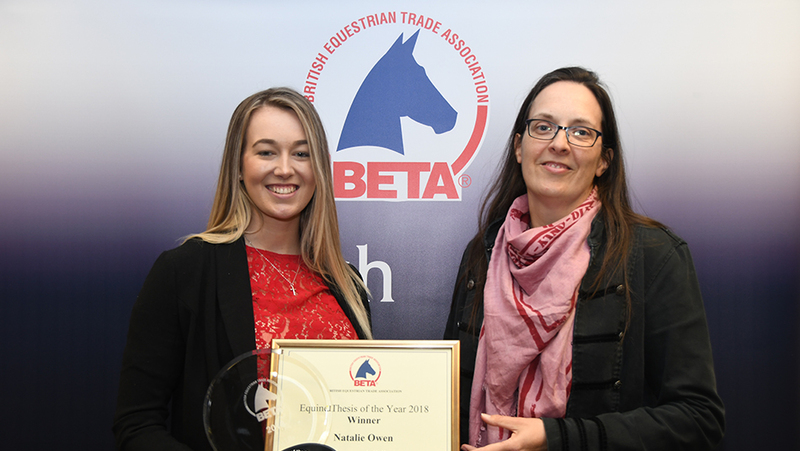 Myerscough College student Natalie Owen has been named winner of the 2018 BETA Equine Thesis of the Year award for her dissertation An Investigation into How Judgements are Formed Regarding Acceptable Quality of Life of Leisure Horses. Natalie’s dissertation, which sought to challenge common perceptions and traditional views on how we judge whether horses enjoy a good quality of life, was focused on understanding owner views and attitudes to management practices. Many owners, she suggested, “humanise” their horses by regarding stables as a “bedroom” where they put them to bed at night. Image: Natalie Owen is presented with her award by Dr Georgina Crossman, chair of the judging panel.